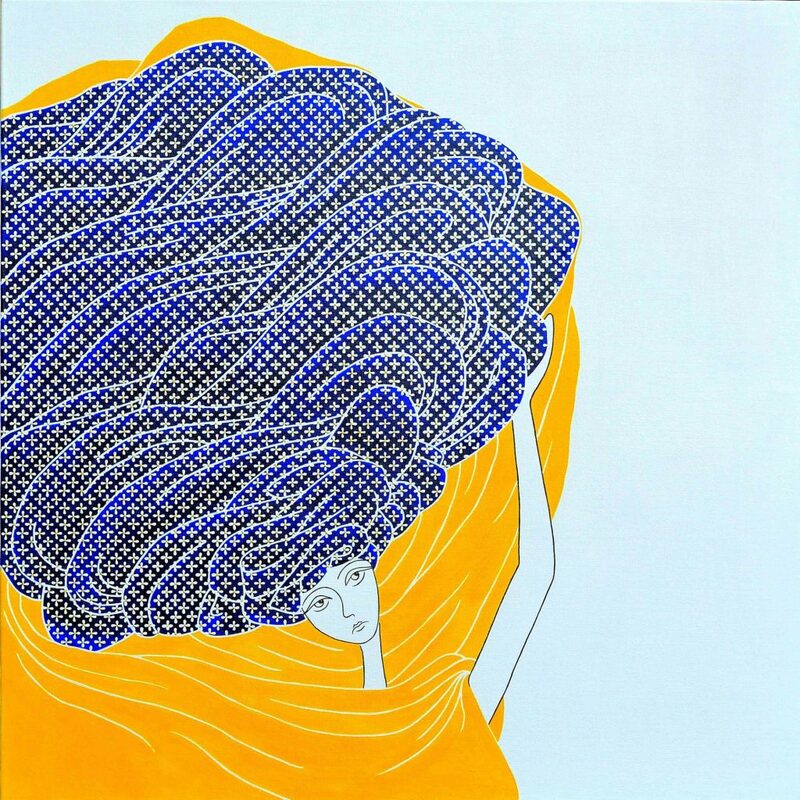 Ameena Khan, an artist living in Tampa, Florida, feels that she’s finally grown into herself as a painter and illustrator. She set aside her career in environmental engineering in 2012 to carve out private uninterrupted time to create meaningful works. Years of experience in lab settings influences her painting style, and as a planner by nature, she can sometimes plot and wait years before beginning a work of art. Her engineering background comes through in her aesthetic. “I prefer to create artwork that is streamlined and succinct: every detail has a purpose, and every mark has its place,” she explains. Her detailed portraits and patterned backgrounds are as precise and deliberate as the messages that accompany them. Many pieces call to mind Ottoman miniature paintings on marbled papers, but where she leaps ahead is in her use of bolder color choices and grander scale — up to 36 by 36 inches. The Ottomans and Persians were known to use egg tempera, made from ground natural pigments mixed with egg whites, to create their masterworks. Khan, however, prefers acrylic for its versatility and manageability: It dries quickly, allowing her to add layers, crisp clean lines and patterns without having to wait weeks for the paint to dry. She also employs touches of gold in her works, similar to the Islamic manuscript illumination seen in traditional book arts. 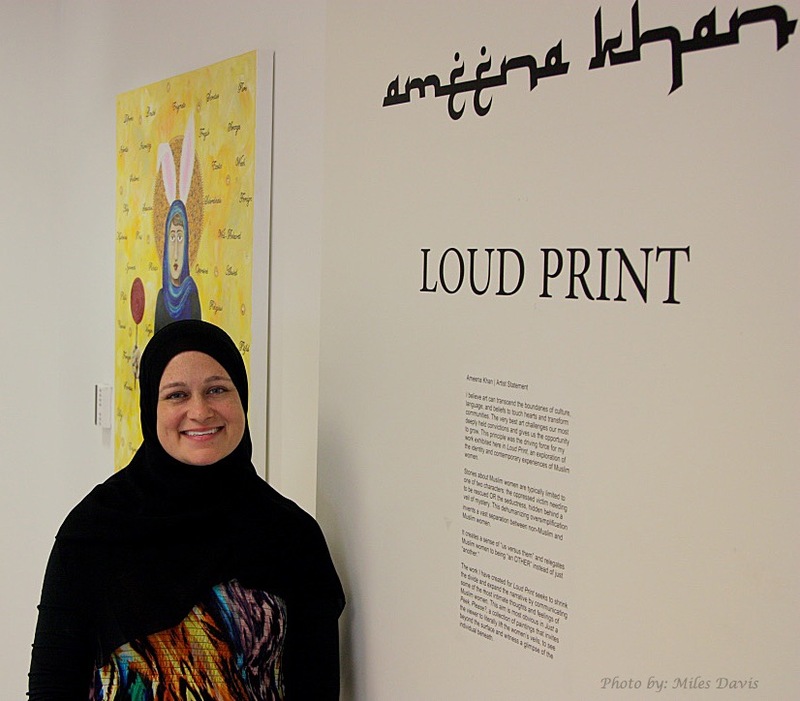 Her newest collection, Loud Print, recently on view at HCC Gallery 3 in Tampa, touched on complex and emotional issues surrounding Muslim women and Islam. The work had a profound effect on viewers. Part of the collection, a series entitled Just a Peek, Please?, includes 26 paintings inspired by quotes from Muslim American women. The paintings are concealed behind scarves, many volunteered by the women themselves, and the viewer has to lift each veil to glimpse the artwork — the audience becomes voyeurs into the private thoughts, secrets, cultures, family lives and faith experiences of the diverse group of women interviewed for the series. Loud Print’s depth of exploration and understanding comes not just from the masterful renderings Khan has created, but from the anonymous quotes and ruminations culled from other women, which form the base for many of the pieces. One painting with an especially poignant quotation, transcribed in the triptych Crown of Glory, shares the journey of one woman from youth into adulthood, evolving through her relationship with hijab and faith: from a feeling of ecstasy, to uncertainty and pain, and finally to peace. 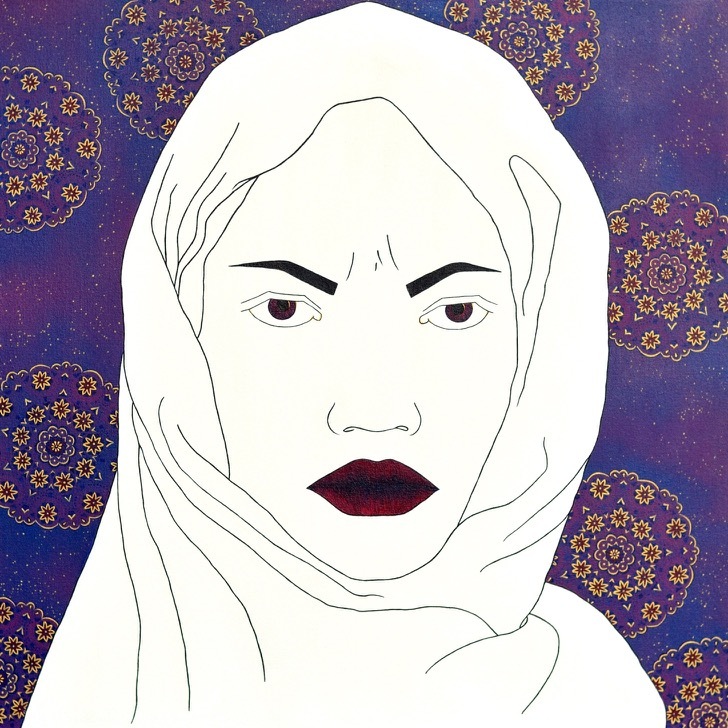 Other pieces challenge the viewer to empathize with covered Muslim women, but not for her assumed oppression or need to be liberated; in fact far from it. In No Need for Rescue, a skin-toneless, cultureless and nameless veiled white figure scowls at the viewer, in contrast to the beautifully elaborate decorated background: a commentary on the misplaced desire of people who want to save Muslim women from themselves and their choices. Khan also expresses the frustration that many women feel in a world that judges and misunderstands their devotion, making them a more visible, obvious and “easy mark” for localized acts of violence and terror. In Target, from the Just a Peek, Please? series, Khan shares a quote from a woman who recollects less dangerous times before scapegoating reared its ugly head. The tendency to judge comes not only from non-Muslims, but also from within the Muslim community. In Is it Enough Yet?, the central figure stares apprehensively upward at her tightly coifed head wrap extending the full height of the painting. No matter how little or how much fabric a woman wears, or how she carries herself, she is bombarded with criticism and comments from fellow Muslims, and struck by self-doubt as well. In A Difficult Task, another teetering weight of fabric piles atop a woman’s head, visual testament to the heavy weight and responsibility carried by Muslim women who cover and are therefore easily identifiable as Muslim. The weariness on her face is apparent as she reaches to steady the drooping folds. Khan’s Loud Print exhibition successfully gives voice to a growing number of women in the U.S. who are fearful or hesitant of speaking out about their experiences. 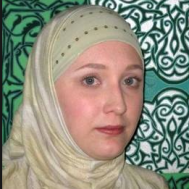 They’ve been silenced by an ever-growing distrust of their thin, plain and printed headscarves — mere symbols of their faith and steadfastness in the face of cultural terrorism, misplaced anger and growing Islamophobia. To contact, email: art@ameena-khan.com or visit www.facebook.com/AmeenaYKhan/. Janet Kozak is an artist, arts writer, and activist.